Obituary for Harry J. Cornell | Langeland Family Funeral Homes, Inc.
Harry Cornell died on June 22, 2018, at the age of 93. He enlisted in the Army Air Corps at the age of 18 and served as a tail gunner on a B-17 bomber, completing 35 missions over Europe and Germany during World War II. After his service, he returned to Kalamazoo, where he met and married the love of his life, Gertrude Bunschoten. They enjoyed traveling and camping together throughout the United States. After retiring from General Electric, he and Gertrude became Florida snowbirds, and they sold at flea markets and festivals in many states. 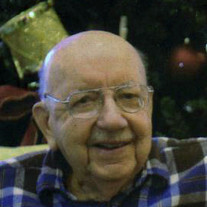 He is survived by his son, William (Phyllis) Cornell, daughter Linda (Stephen) Stanford, grandsons Christopher Cornell (fiancée Kelsey), Michael Stanford, and Joe (Becky) Rubert, granddaughter Jessica (Marco) Mereu, sisters-in-law Nellie Yahr and Marjorie Bunschoten, and many nieces, nephews, and great-grandchildren. He was preceded in death by his wife, after 69 years of marriage, and by grandson John (Jessica) Stanford. He will be interred at Fort Custer National Cemetery. Friends may meet the family from 10:30-11:30am Thursday, June 28 at the Langeland Family Funeral Homes, Westside Chapel, 3926 South 9th Street where funeral services will follow at 11:30am with Rev. Robert Barton officiating. A reception will immediately follow in the Langeland Family Center. The family suggests that any memorials be given to Hospice Care of Southwest Michigan. Please visit Harry's personalized web page at www.langelands.com to sign the online guestbook or leave a message for the family.